It’s the daughter here! 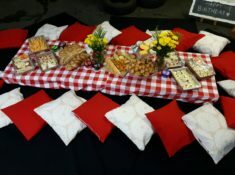 Many of you already know that I had a picnic wedding last year and that it was a massive success. 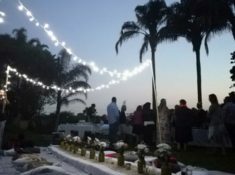 I thought it would be nice to focus a bit on the logistics of planning a picnic wedding and go behind the scenes a bit. We live in Durban, and decided to have our wedding in the Drakensberg. Friends of ours have a beautiful venue there, which you all should definitely go check out! The mom and I took an early morning drive up to have a chat with the owners and see if they would be happy to host our wedding. Lucky for me, they accepted the challenge! I say challenge because this is not a wedding venue. They have hosted a wedding there before but with literally half the amount of guests that we had planned. Our guest total was 60 people, and the venue can sleep about 40 people. We scoured the surrounding areas and noted down potential places for the balance of guests to stay over – this is always a nice gesture for your guests who don’t necessarily know the area too well. 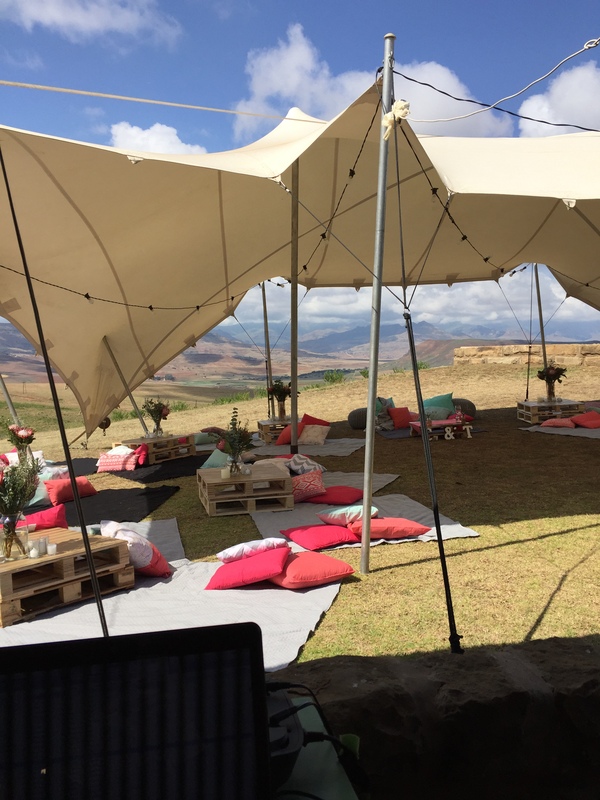 Once finalising the venue, it’s easy to start with the main things: tent, lights, seating etc. 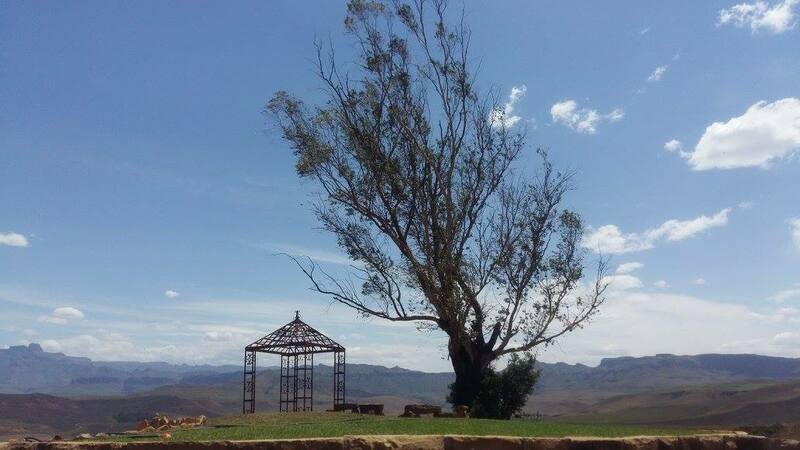 For the ceremony, the venue had erected a beautiful pargola with a breathtaking view of the Drakensberg in the background. So in this area, there really wasn’t much we needed to do as the setting provided all of the beauty already. I simply hired a couple of haybales (which the tiny horses loved!) from a local supplier in the area, who delivered and collected the haybales, and added some flowers here and there. We hired a bedouin stretch tent from Midlands Stretch Tents. The tent was set up by their staff early on the Friday morning before the wedding, which gave us plenty time to work on the reception area. They were extremely helpful, and also the most reasonable with their prices. Now for all the goodies: with a total of 60 people, we estimated about 3 people per blanket, so we had 20 blankets. We grouped two blankets together, and packed the baskets so that it would feed 6 people. So the idea was for groups of 6 to get together. This worked brilliantly. Guests immediately starting mingling and enjoying the yummy foods. For the blankets we went to Waste Centre, measured out the fabric and just got the ladies there to cut my blankets to size already. This saves a ton of time! All I had to do at home, was hem each blanket, just to finish it off. The pillow cases on the other hand, were not so easy. I spent weeks and weeks looking for different kinds of fabric. I had mostly plain coloured ones, and mixed and matched a few with patterns. I had a total of 91 pillows – ideally it would be nice to have about 2 pillows a person, but there ended up being more than enough pillows. These were roughly stitched to the different sized pillows and then hand stitched closed once the pillow was inside. The bold colours looked amazing against the neutral blankets, and amazing background setting. We used pallet tables as a surface to work on – I felt this made it feel more wedding-like and formal instead having our guests work with their food on the floor. We nailed a top to each pallet to make it easier to work on, and just added a bit of gold spraypaint to make it look more glamorous! This made a huge difference to the atmosphere and also created a bit of height and different dimensions to the setting. The centerpieces had to be kept very simple as the pallets weren’t big to begin with, and work space was important. We simply put a vase on each table, with a beautiful arrangement of Protea flowers and fillers from the lovely ladies at Bouwer Flowers. We scattered some candles around as well as I wanted to create a romantic candlelight atmosphere for the guests. Getting all of these to the venue was a bit of stress but luckily we have friends with big cars and trailers. We filled an entire trailer, hilux, staff bus, polo, x-trail, audi, huyndai and another 2-3 cars. All the wedding goodies arrived early Friday morning, giving us the entire day to set everything up. Most of the food we served were home made by the dear mother. 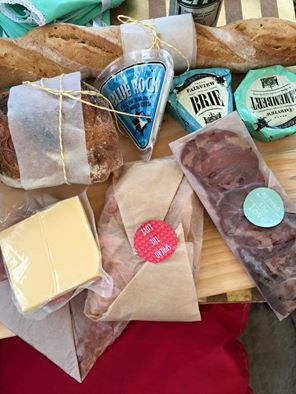 We had hummus, feta olive preserves, pickled veggies, gherkins, onion marmalade (these were all home made), artisan breads, snoek pate, cold meats and cheese. These were all repackaged to make it look more pretty and weddingy and stuck some custom made stickers to all the items. For the music we created our own playlists. We had one for the ceremony and dinner, which was your typical jazz lounge / cafe kind of music. Really nice and relaxing! And then we had the more serious dance music a little later on. We hired speakers which came with a little built in sound system and just allocated the music to a more responsible person, in case there were any problems. It makes everything easier when you have a dedicated person overseeing certain aspects of the wedding. 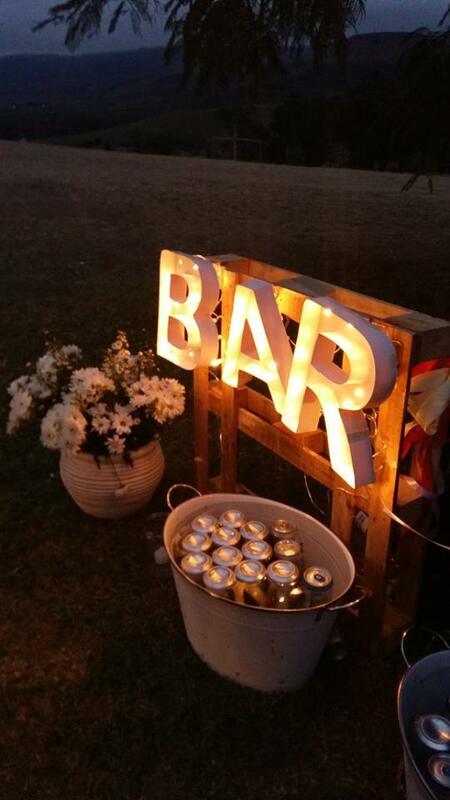 We had set up a little bar area under a tree, which we luminated with an amazing BAR sign, which the husband made, and hung some candles from the tree in baulbs. We provided all the drinks, and kept it really simple, seeing as it would be self-service. Beer cans, ciders, water dispensers, wines and some juices. It’s important to consider all of your guests – not everybody drinks alcohol, so it’s important to have some juices as well as fruit infused water. Make sure the wine is screw top as you don’t want your guests struggling with wine openers etc. Same with your ciders. We had a mix of red and white wine and some soda water for the guests to mix up their drinks a bit. The free alcohol definitely lead to one helluva party at the end of the night. When all was set and done, the husband and I got up early the following morning to start cleaning up. I can believe that most people would hate to do this, specially after your own wedding. But when you’ve had the amount of help that we did, the last thing you expect is your guests to start cleaning up. We had hired some staff as well to help with the clean up, so we really just directed everyone, showing where goes what. The rule was simple, what you bring, you take back – that way i knew exactly who had what and nothing went missing. The hired items were all collected again by the various suppliers. All in all, a really easy wedding to plan. When you let yourself go to the process, it all becomes much easier. Of course there were things that went wrong, but those little things don’t matter. I look back at our wedding and I think how amazing it was. How happy all of our guests were and how relaxed everyone was. Everyone made friends with everyone. And that’s exactly what we had invisioned. I will give anything to go back to that weekend, and have it all over again.